Walkers make their way through the night. A body lays below in the grass as one walks by. The body gets up after a couple of seconds. It is Justin, he has turned after Rick kicked him out of Alexandria. Rick wakes and kisses Michonne on the arm. He touches Judith’s head down the fall as she sleeps. He touches a piece of the porch that has been nailed to the wall. It has Carl and Judith’s handprints on it. He heads out the front door into the quiet morning and checks the gardens. He sees a red plump tomato, picks it and leaves it at Carl’s grave. He heads back to the house to see Michonne. They talk about how she has been working on the charter. They also need to bring Judith to see Siddiq. She has a cough. Rick thinks they can all go while Maggie holds down the fort. Michonne warns that Maggie is still mad. Rick thinks that she will see it their way soon enough. He thanks Michonne for all that she has done. He asks her to take a break and build their own future. She is taken aback for a moment but then they agree. Maggie comes down the road on her wagon. Some of the saviors are there. They are looking for someone who disappeared. Jed takes a tomato out of the back of her wagon and takes a bite right in front of her. He refers to her as the widow. Laura comes up and thanks them. They move on, seeing a walker in the distance. Meanwhile, Rick, Judith, and Michonne have a family day; playing in the woods, reading books, visiting Siddiq and more. They get a report that a savior has been found and it looks like they were murdered. They are all fighting over who killed Justin. Knives, axes, and guns are out when Rick shows up. He makes them all move and get back to the bridge. He asks Gabriel where Ann was the night before because people think she killed him. One of the saviors they trust asks for a gun. Maggie tells him that wasn’t the deal. Maggie and Rick talk. They wonder who could have done this. Gabriel checks on Ann. She tells him she didn’t do it. He tells her he vouched for her, telling Rick he was with her all night. He asks her if she saw anything. She doesn’t answer He presses her again. She tells him no. Meanwhile, Rick is questioning Daryl. He is insulted that Rick would ask. But he knows why Justin was killed. He thinks it was a bad idea to bring all of these people together. Rick doesn’t. Daryl reminds him of Glenn, Sasha, and all the others. Maggie works with a woman from Oceanside to clear a group of walkers from a nearby house. Maggie holds her own but the other woman starts to get overwhelmed. Rick and Daryl show up. They radio to grid 5, who should have shown up to help. They head there and discover another woman from Oceanside, Arat, is missing and has been taken. They all split up and start looking after a quick meeting. Carol and Rick talk while they look. Carol explains that sometimes she wants to pull the trigger. Rick tells her that they cannot do that. They have to protect all life. Meanwhile, Maggie and Daryl are paired up. They talk about Rick. Maggie knows what he is doing is good for her son’s future. But it still bothers her. They find a walker and another body with an arrow in it. 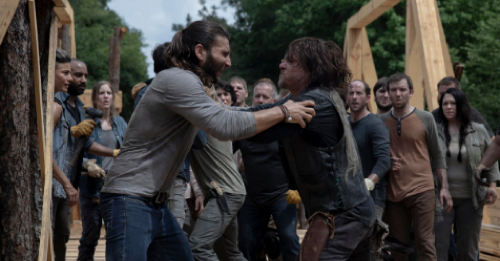 Daryl thinks he knows who took Arat. Ann goes back to the junkyard. She opens a metal box. There is a walkie-talkie inside. She radios to someone. She tells them she knows they are in the range, she saw the helicopter last night. He asks her if she has an A or a B. The person wants an A and they have a deal for tomorrow. Gabriel shows up. He wants to know who she is talking to. She breaks down and tells him she has traded people for supplies like she almost did with him. She had to do it before to help her people. She asks him to go with her. He tells her he cannot. He has to tell Rick. She knocks him out. Rick and Carol come up on Jed in the dark woods. He grabs Carol and holds her with a knife. Rick points the gun at him. He promises he will kill her faster. Rick lowers his gun, Carol turns and slashes Jed. Rick tells him to keep the pressure on it. They will get him back to camp and stitch him up. Daryl and Maggie come up on a few Oceanside women holding Arat hostage. They want to kill her. She took out their families back when Simon was around. They saw how Maggie dealt with Gregory and now they are going to do the same. Rick’s rules aren’t the only rules. Arat pleads, they made her do it. She killed an 11-year-old boy. Maggie and Daryl leave and let them do their thing. She tells him on their way home it is time to see Negan.